Choosing the right motherboard when AMD or Intel decide to change memory standards is never a fun proposition. There are always two choices; you can stick to the existing memory format that's plentiful and cheap, or future-proof your computer by adopting the new memory type that's always more expensive and generally less plentiful on store shelves. In this respect the sticker shock of DDR3 RAM isn't as bad as it used to be. Intel broke the world into DDR3 memory a while back, DDR3 memory isn't hard to find and there are many different speeds to choose from. The socket AM3, AMD Phenom II X3 and X4 processors bridge the memory divide with prudent backwards compatibility on socket AM2+ motherboards. AMD is nice that way, not forcing you to buy three sticks of DDR3 when the economy is all doomy and gloomy. Enter the ASUS M4A78T-E motherboard, the first socket AM3 board to cross PCSTATS test bench for the popular 45nm Phenom II X3/X4 processor families. ASUS' M4A78T-E is nearly identical to the M3A78-T which we reviewed recently, but naturally as a socket AM3 platform it supports DDR3 1066/1333 memory. To be specific the M4A78T-E has four slots for DDR3 memory, with a maximum capacity of 16GB (when running in a 64-bit operating system), at speeds of 1066/1333 and 1600(O.C.) MHz. The ASUS M4A78T-E motherboard is built on AMDs 790GX integrated graphics processor and SB750 southbridge, supports HyperTransport 3.0 at 5200 MT/S and has a 128MB DDR3-1333 memory buffer built in just for the Radeon HD 3300 IGP. Like all AMD 790GX motherboards, you can think of it as an IGP platform with a entry level videocard. The Radeon HD 3300 on-board graphics solution is based largely on the Radeon HD 3200 IGP, but with a core overclock fo 700MHz from 500MHz, making it one of the fastest integrated graphics chipsets. The Asus M4A78T-E equips the Radeon HD 3300 with an additional 128MB of DDR3 Sideport memory for additional graphics oomph. The board is well equipped with Analog VGA, DVI and HDMI video outputs. The HDMI port supports HDCP, provides audio, and can output video at 1080p resolution. Like it's sister motherboard the M3A78-T, the ASUS M4A78T-E is an ideal candidate for a Home Theatre PC system. If suped-up IGPs don't get your heart pumping never fear! ASUS' M4A78T-E motherboard has a pair of PCI Express 2.0 x16 slots that will readily accommodate gamers with one, or two PCI Express videocards. A lone videocard gets x16 lanes of bandwidth, two videocards in CrossfireX run with x8/x8 lanes of bandwidth. The AMD 790GX chipset supports hybrid Crossfire, so you can merge the on-board graphics card with the Radeon HD 3300 for additional performance, or even additional monitors. Along with the PCI Express x16 slots, a pair of PCI Express x1 with a single lane of bandwidth each, and a pair of legacy PCI slots are present. In terms of connectivity the M4A78T-E is well stocked; five SATA II ports with RAID 0,1,5, 10 and JBOD, IDE for legacy drivs, one eSATA port, two Firewire ports (one via header), six USB 2.0 jacks (six via header), 8-channel HD audio, an optical SP/DIF output and Gigabit LAN. With a street price of around $191 CDN ($150 USD, $120 GBP), the ASUS M4A78T-E motherboard is about $20 more than its DDR-2 sibling, the Asus M3A78-T. Factor in the cost of additional DDR3 memory, and you can expect to pay a fair amount more to get your new Phenom II processor fully kitted out. Is it worth the additional cost to build a DDR3 Phenom II PC right now? That's a very good question. The Asus M4A78T-E is built to take advantage of high-end videocards like the Radeon HD 4870 X2 , so it's got plenty of room available for bulky dual-slot-wide videocard heatsinks. The PCI Express x26 slots have two spaces in between them, so even the widest graphics cards have enough breathing room. When the Radeon HD 3300 IGP is being used by itself, or a single Radeon or Geforce video card is plugged in, there's plenty of space for peripherals. 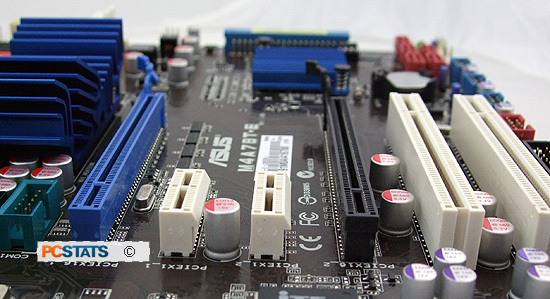 While its predecessor has a split design of parallel and perpendicular SATA connections, the Asus M4A78T-E motherboard has all its SATA II jacks grouped together in the right corner of the board. It's easier to plug the cables in, but more challenging to keep the inside of the PC case looking neat. The remaining front panel headers are grouped together on the bottom edge of the motherboard, with three USB headers and an additional firewire port. These can be connected through ASUS' Q-connectors, which make them quick and easy to set up. There's also a S/PDIF output, and an AAFP header for Azalia high-definiton audio. The I/O shield for the ASUS M4A78T-E is rounded to prevent nasty finger cuts when being installed, and has six USB ports, DVI, VGA and HDMI ports, as well as a firewire and eSATA ports for connecting external hard drives. Gigabit lan ports and PS/2 ports are included as always. In addition to using the HDMI for audio output, ASUS have provided an optical S/PDIF output and a seven-channel surround-sound stereo output. Simple passive aluminum heatsinks cool the AMD 790GX, SB750 and processor VRM MOSFETs. The AMD 790GX northbridge doesn't react very well to overheating, so do yourself a favour and ensure there is good airflow moving through the PC case. If you experience heat issues when taxing the 790GX in a 3D game (this is the only time you may), just aim a fan in the direction of the northbridge heatsink. The Asus M4A78T-E has a pair of fan connectors that can be used for this purpose. 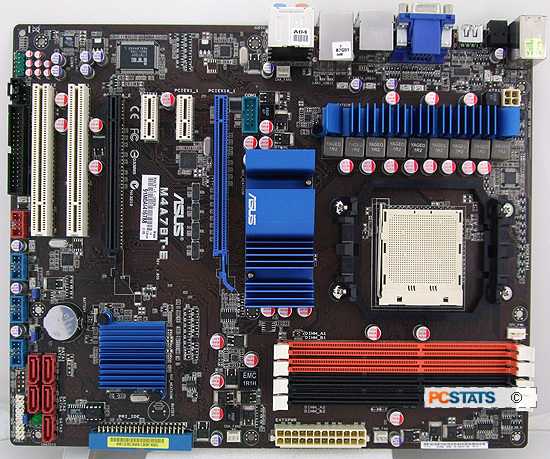 It's time to start putting the Asus M4A78T-E motherboard through its paces. 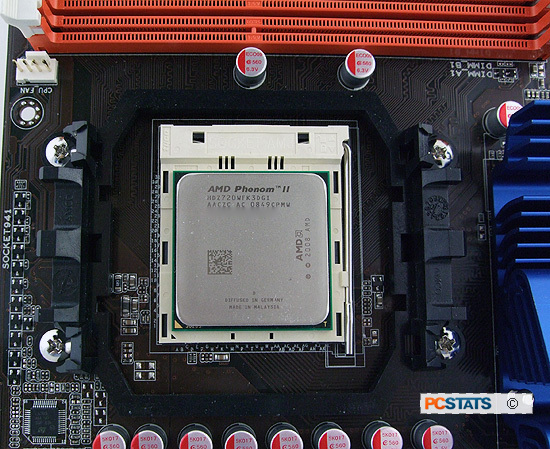 The Phenom II X3 720 Black Edition processor has been dropped into the new socket AM3 slot, so let's start off with some video playback and see how much of a difference DDR3 memory really makes.